SoftBaby has won over the Tinseltown set (fans include Drew Barrymore, Jennifer Garner, and Hayden Panettiere), and it’s easy to see why. The brand features organic cotton onesies, blankets, rompers, tees, and pants, as well as some of the cutest bloomers we’ve seen. 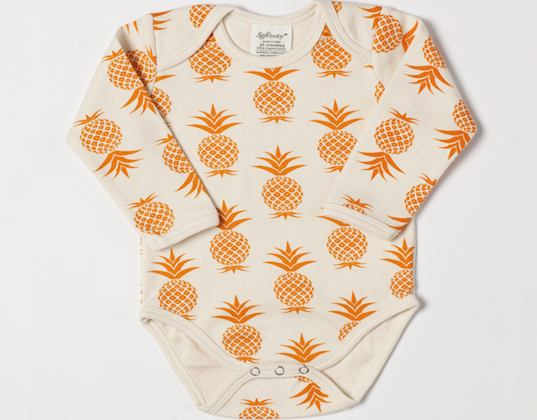 We love that Softbaby’s style includes classic, more neutral colors and patterns, such as their organic dots playsuit, as well as brighter, more funky pieces, like the tropical bodysuit. Printed with water-based inks, SoftBaby’s clothes feature vivid prints, a wide variety of patterns, and a super-soft organic cotton fabric that will make baby as comfortable as he is cute. The animal prints include deer, crabs, dolphins, and penguins, any of which would make for sweet baby shower gifts (especially when paired with matching baby blankets). There are also plenty of gender-neutral options available, including cheerful chevron stripes, pineapples, and nautical designs such as boats and anchors. We can’t resist their adorable bloomers which feature and a cute puppy dog or sayings such as “Bon Voyage Baby” and”Rebel Baby.” You can’t really go wrong when choosing from Softbaby’s versatile and hip line; we’re already pondering which pieces to buy for all of our pregnant friends! SoftBaby�has won over the Tinseltown set (fans include Drew Barrymore, Jennifer Garner, and Hayden Panettiere), and it's easy to see why. The brand features organic cotton onesies, blankets, rompers, tees, and�pants, as well as some of the cutest bloomers we've seen.